Sometimes I have some scratch & dent nesting boxes or other items available. They may be built using pieces that are cracked, cupped, or have large open knots. The boxes may have other (usually visual) imperfections, or, they might just be plain ugly. There is a small chance that the longevity of these boxes may be slightly diminished, but that chance is pretty small. The effectiveness as a nesting structure is not changed. I price theses 2nd's based off of their imperfections, but usually they have a reasonable discount from full price. I always give the boxes a little extra attention with screws and glue, in critical spots to neutralize any imperfections whenever possible. 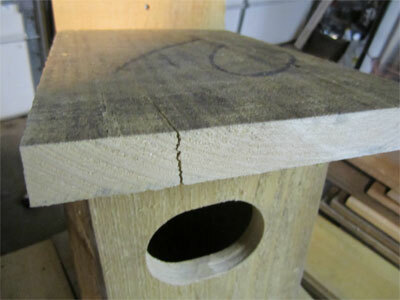 Please contact me for information about scratch & dent nesting boxes and to check availability.